Incoming water tangentially enters its multiple hydro cyclones, generating a strong centrifugal effect. Approximately 80% of the incoming dirt load is spiralled down to its clear sediment chamber. The outgoing water is finally polished via its inbuilt cartridge filter, producing crystal clear water. MultiCyclone Plus’s sediment chamber is easily cleaned by opening its purge valve. Only 15 litres of water is discharged. The MultiCyclone Plus’s centrifugal section filter pre-filters up to 80% of the incoming dirt load before it reaches the filter cartridge, magnifying the capacity of its 40 ft2 filter cartridge by up to 5 times. 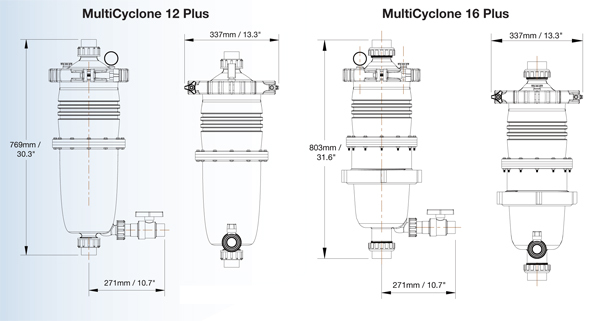 MultiCyclone Plus has a filtration capacity equivalent to a 200 ft2 cartridge filter or a 24” (600mm) sand filter. 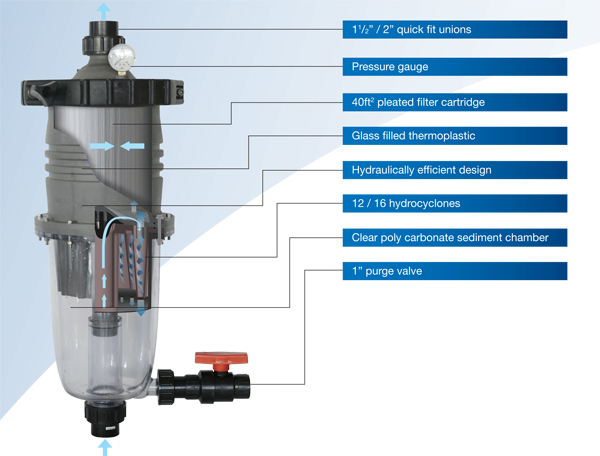 The New MultiCyclone Solids Remover from Absolute Koi is an innovative pre-filter device that is both capable of saving water and reducing filter maintenance. The MultiCyclone filter will filter out up to 80% of the incoming waste from your koi pond. The MultiCyclone filter works on the principal of centrifugal water filtration, with no moving parts and no filter media to clean or replace. These 'plug and Play' mechanical filters will provide years of maintenance free service. The MultiCyclone filter is best suited and designed as a pre-filter or from a skimmer unit, reducing the ammount of fine particules before entering your filter. The MultiCyclone Pre filters are pressure units and require the water to be pumped in to the unit. How Does MultiCyclone Filter Work? The incoming water from the base of the MultiCyclone filter is guided by a diverter plate so that it enters 16 multiple hydro cyclones tangentially, generating a strong centrifugal effect. This spins the sediment out to the hydro cyclone’s wall and then spirals it down to the sediment sump, while the cleansed water spirals upwards towards the centre of the hydro cyclone where the water flow reverses and then spirals upwards through the outlet at the top of the device. The accumulation of sediment can be visibly monitored through the MultiCylcone clear sediment sump. The MultiCyclone filter is cleaned by simply opening the 25 mm purge valve. Only 15 litres of water is discharged to clean the MultiCyclone filter of sediment. Incoming water enters 16 hydro cyclones tangentially, generating a strong centrifugal effect. The sediment is spun out to the hydro cyclone’s wall, and then spirals down to the sediment bowl. The filtered water migrates towards the center of the hydro cyclone where the flow reverses and spirals upwards through the outlet. Accumulation of sediment can be visibly monitored through the MultiCyclone’s clear sediment bowl. The MultiCyclone is easily cleaned by opening the valve. Only 15 litres of water is discharged to cleanse the MultiCyclone. It is not very often that a company finds itself with a truly revolutionary product; this is what we have with the MultiCyclone filter. It is sure to change our concept of water filtration.